I love strawberries in and on anything; my morning oatmeal, salads, drinks, and baked goods of course. Once the California Berries are ripe, I go crazy with the strawberries. Of course local strawberries are the best, but we'll be waiting a couple of months for those, because it was briefly snowing again on Saturday, Grrr! 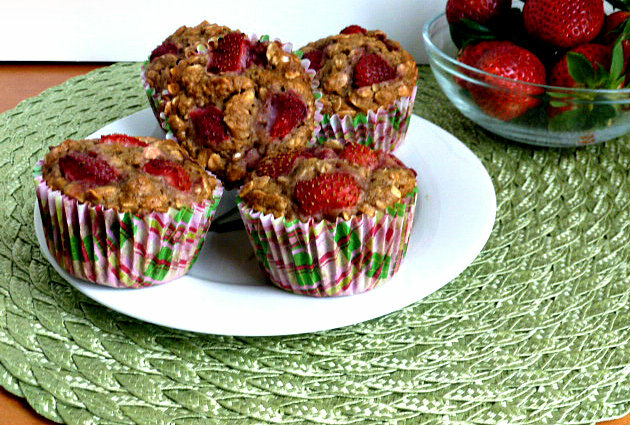 I added strawberries to my yummy Applesauce Oatmeal Streusel Muffin recipe with great results. I made these gorgeous muffins to take to a friend's house for coffee. I made the Applesauce Oatmeal Streusel Muffin recipe, minus the topping, and added about 1 cup of fresh strawberries. They were delish, bursting with loads of strawberry flavor. Last week I also tried to make Banana Strawberry bread, which was an epic fail. I believe that I added to much Greek yogurt, and too many bananas. As I made these muffins, I held my breath, until they were out of the oven, and they were perfect. These muffins have more rolled oats than flour, and I stirred in the rolled oats, as is, because I like the texture they give to the muffins. in addition to the rolled oats, the muffins are healthy with applesauce and coconut oil, that makes them so moist, which means there is no butter. Then I folded in about 3/4 cup of chopped strawberries, and topped with 1/4 c sliced berries, ripe red, strawberries that look like strawberries, smell like strawberries, and taste like strawberries. Looks can be deceiving with strawberries sometimes. Do you smell the strawberries before you buy them,? I do. enjoy! Heat oven to 400°F. Line twelve medium muffin cups with paper baking cups or spray with cooking spray. Fold in 3/4 c chopped strawberries. 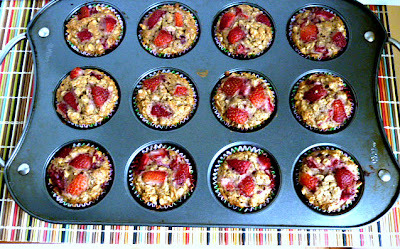 Top muffins with reserved sliced berries. Yum! I love strawberries in baked goods. Your muffins sound delicious!!! Oh yes, I always smell the strawberries before buying them. If there's no smell, I don't expect there to be a flavor either. :) The muffins look delicious, Becky. I like the idea of more oats than flour. Hope some warmth heads your way soon. 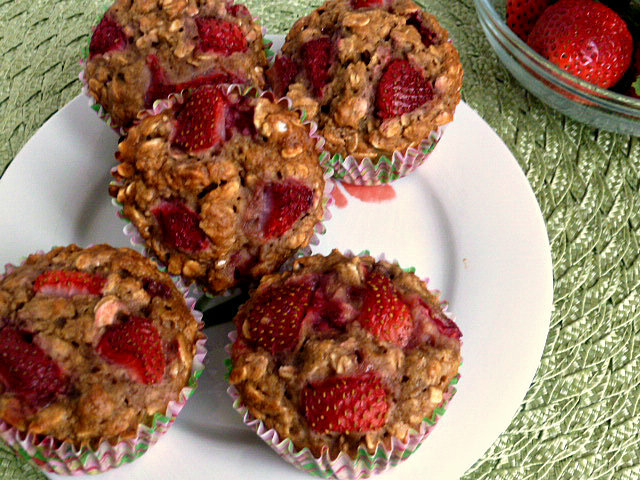 The added oatmeal in these muffins give great texture, and the strawberries add great flavor. Noe it's supposed to rain the rest of the week. Those muffins are absolutely gorgeous! Would love to be in that kitchen when they came out of the oven! Thank you! I had to eat one muffin, as soon as it came out of the oven, so good. My kitchen smelled so good, and the muffins fresh out of the oven were irresistible. Beautiful muffins, Becky! I love that you've added strawberries :) We're going tod be back in the 30's on Saturday morning...I bet it will be even cooler for you. Bring on summer! One bite of these muffins, and you think that it's a warm summer day. Hope that it warms up soon for both of us. Just wonderful choice for breakfast! I love those strawberries in your muffins! These muffins make a healthy breakfast treat. I have had several for breakfast! Thank you so much. these muffins are great. Yep, I smell them and they smell good!! I have seen some berries, but I'm still holding out for the sweeter ones. Our Spring has been so erratic is why I think. Hope you are off to a good week. I'm so sore from all that hiking. These look so good! I'm so happy that strawberries are back in season. I just bought a big 2 lb carton, and we're already almost finished with it! Thank you so much for sharing, Becky! Becky these are perfect to grab and go in the mornings!!!! So looking forward to ripe strawberries in the summer to make fabulous treats like this!